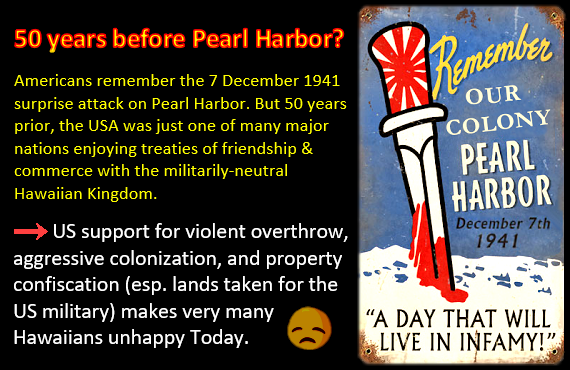 50 years before Pearl Harbor? Americans remember the 7 December 1941 surprise attack on Pearl Harbor. 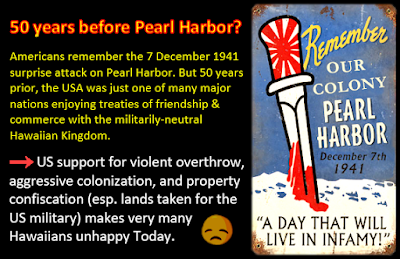 But 50 years prior, the USA was just one of many major nations enjoying treaties of friendship & commerce with the militarily-neutral Hawaiian Kingdom. US support for violent overthrow, aggressive colonization, and property confiscation (esp. lands taken for the US military) makes very many Hawaiians unhappy. Today.